The edition history after this becomes complex, but one notable development from 2007 should be highlighted: namely, the republication of the core 2nd Edition books as Rolemaster Classic. This comes across as a tacit admission that the subsequent editions of the game are somewhat less-than-classic, so when the bug of curiosity bit me and I decided to check out Rolemaster it was the 2nd Edition I looked to. The core of this edition consists of three books – Character Law and Campaign Law, Arms Law and Claw Law, and Spell Law. The latter two are the direct descendants of the early ICE releases which were designed as optional alternate combat and magic systems for fantasy RPGs. (They seem most compatible with AD&D and Runequest, which makes sense since those were the biggest beasts in the fantasy genre as far as RPGs went when Arms Law first came out.) 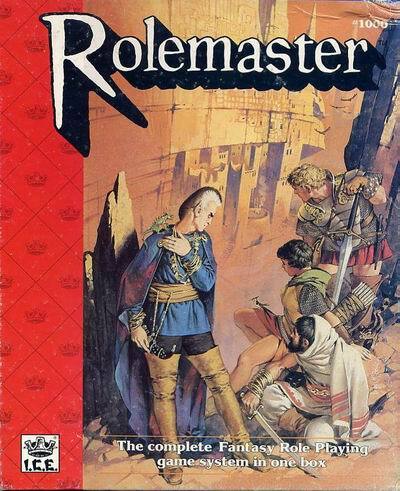 It was only with the initial publication of the character generation and campaign rules that the Rolemaster system became a viable independent game in its own right. Despite this patchwork history, the system is surprisingly cohesive. At the heart of actual play is a simple dice mechanic which (thanks to Monte Cook being a Rolemaster line editor early in his game design career) will be familiar to D20 players: roll dice (percentiles in this case), add your skill and any appropriate bonuses and penalties (some of which may be level-dependent – for instance, fighter-type classes get a major boost to combat rolls based on their level), and try to beat a target number. For ordinary, uncontested skill use the number is 100; for combat the base number you need to get to inflict some damage depends on your enemy’s armour type. In any attempt to inflict damage on someone, cross reference their armour type with your roll on the appropriate weapon or magical damage type table; if a critical hit is indicated, roll a critical hit, if a fumble is indicated roll a fumble. That’s pretty much it in play; although some of the tables are intimidatingly big, once you have worked out how they are used they’re really quite simple. Somewhat more complexity arises in the process of character generation, but even then the system won’t seem complex at all to those who have engaged with the advanced customisation toolkit that is D&D 3.X character generation, or for that matter D&D 4E character gen, the system that coined the phrase “It’s not so bad if you use the online character generator” – until the generator got pulled. At its heart the Rolemaster character generation system is an amalgam of three different approaches – the statline/class/race/level approach of D&D, the skill-focused approach of Runequest, and the point buy approach that was being pioneered by games like Champions and The Fantasy Trip. You start by rolling stats – both your current stats, and the potential maximums your stats can reach, which is a neat way to instantly get an idea of what sort of directions your character can develop in. Then you select race and class, and then you buy up skills with skill points. The cost of skills vary depending on your class, so if you take the path of least resistance and go for cheaper skills you will probably end up with a decent representative of the class in question, or if you want to break the stereotype a bit you can but it is somewhat suboptimal. This is perhaps best illustrated by the system for learning spells. Rather than learning them one at a time, you spend skill points on spell lists and then you get to roll once a level to see if you learn a portion of a spell list you have invested points in, the probability being based on the skill level you have and whether your class is a full, semi- or non-spellcasting type. (And of course, spellcasters pay less points per skill level in spell lists than semi-spellcasters, who pay less than non-spellcasters, so there’s a double hit there.) On top of all that, spellcasters learn a larger chunk of a spell list each time and can learn higher-level magic than non-spellcasters, and have access to more spell lists to boot. When you add all this up it is clear that trying to make non-spellcasters cast spells is far and away the most suboptimal thing you can do in this system; to their credit, ICE make sure there’s plenty of guidance on this sort of thing to help you spot that. For the benefit of referees (who naturally won’t want to go through the full character gen process for every NPC), a table of NPC stats for characters of each class at a variety of levels (1, 5, 10, 15 and 20) is provided for easy lookup – this can also help players in deciding how to develop their characters as they level up. One wrinkle of the character advancement system is that you have to commit your character development points for the next level at the start of your current level – so, for instance, when rolling up a new level 1 character you have to plan out your expenditure for level 2 at the same time, and when you hit level 2 you implement those changes and then plan level 3. Though eminently ignorable, the rule does have two interesting effects. The first is that it sets a downtime between recognising that you may need a skill and actually obtaining it, limiting the extent to which you can make spur of the moment development choices based on immediate needs; the second is that it gives some guidance on what sort of thing your character is practicing in downtime. The neat thing about all this is that once you’ve got a handle on how classes and spell lists are designed, it’s comparatively easy to come up with new ones – in fact, it seems as though the backbone of the Rolemaster Companion series of supplements was the extensive series of optional classes and spell lists included in there. Of course, the Companions also included a brace of other optional rules, which may in the long run have contributed to Rolemaster‘s reputation for complexity – the issue not so much being the core design as referees including a grab-bag of optional stuff without necessarily taking into account smoothness of play when picking out the optional rules to use. On balance, though, I think most of the game’s complexity is front-loaded – once you get past character generation, it’s comparatively smooth sailing from there on in. Given that these days that almost seems to be the industry standard for traditional RPGs (and it’s truly rare nowadays to find a character generation system as simple as early D&D‘s “roll stats, pick race and class, buy equipment and go”), I’d say classic Rolemaster is downright middle-of-the-road as far as design goes. If anything, in several aspects Rolemaster seems to be ahead of its time, including innovations which even modern designers could afford to take advantage of. The main monster book, Creatures & Treasures, is notable for avoiding the “alphabetical listing” format that had been used for monster supplements from the AD&D Monster Manual onwards; instead, creatures are arranged by category, so all the demons and otherplanar entities are under one section and all the dinosaurs under a different one and so on. This to me seems quite neat, particular from an adventure design and preparation perspective: for instance, if you know you want to have some sort of dinosaur to use, you can browse the various dinosaur types until you find one of the appropriate ferocity you’re looking for, and it’s quite helpful for working out how various creatures fit in with the overall category they belong to. Of course, this is all very well, but it doesn’t answer the central question: would I ever consider running or playing this edition of Rolemaster, given that I already have a class-and-level-and-skills-based fantasy RPG I’m very happy with in the form of 5th Edition Dungeons & Dragons? The answer to that would be, “yes, under very particular conditions”. Firstly, I’d give Rolemaster serious consideration for a group who wanted a game which offers more character customisation than 5E does, and would even prefer it for that purpose than D&D 3.X. The absence of feats may bug some, but personally I don’t miss them, and the class designs more or less hit a nice balance between gently discouraging extremely class-inappropriate builds whilst at the same time enabling a reasonable range of potential builds for a class rather than there being only one build that well and truly makes sense. Secondly, I’d consider it for a group who wanted a combat system that yields somewhat more varied results than “you miss”, “you hit and do a bit of damage,” and “you hit and do a bunch of damage” – those critical tables are legendary for a reason. Thirdly, I’d probably use it if the group got a yen to play a game based in Shadow World, the official campaign setting for 2nd Edition Rolemaster. Cobbled together by Terry Amthor and with its basic governing principles described in the Shadow World Master Atlas, Shadow World is the result of Amthor not only trying to reconcile three distinct modules in the preceding Loremaster range (The Iron Wind, Cloudlords of Tanara, and The World of Vog Mur) but also producing a campaign world which works according to the implied metaphysic of the Rolemaster rules as written; the end result is a fragmented world of discrete little cultures and civilisations, travel between which tending to be controlled by the secretive Navigators, and with various world-spanning tensions unfolding such as those between the villainous Dragonlords (premiere servants of the terrifying Unlife) and the enigmatic Loremasters. The fragmentary nature of the world makes it feel suitable for a fairly episodic campaign to me, with each episode visiting a different microculture. So, in short I’m not sorry I looked into old-style Rolemaster – it’s clearly not going to be everyone’s cup of tea, but it certainly doesn’t deserve the reputation it’s suffered from to this point when there are plenty of games of a similar vintage which really do fit the “needlessly complex” tag much better, such as Chivalry & Sorcery or Aftermath!. From what you’ve written here, I feel like I’d be up for an exploratory Rolemaster game. I always like character flexibility, and although it obviously wants to make your choices hefty (particularly the spellcaster stuff you mentioned) that’s not a problem if it’s upfront about it. The skill training rules also seem interesting – along similar lines to Traveller, I think? Both make you decide what skills you’re focusing on well in advance. For the last 30 years, we have just used Arms and Claw law weapon tables as our combat system for what is essentially a home brew system. In this form it is pretty simple, consisting of 3 rolls. 1st initiative -1d10; 2nd, an attack roll 1d100 which is modified with attack and defense values; 3rd, 1d100 critical roll if applicable. Players have copies of their specific weapon tables, to keep the melee moving. It does provide some very exciting and memorable combats.